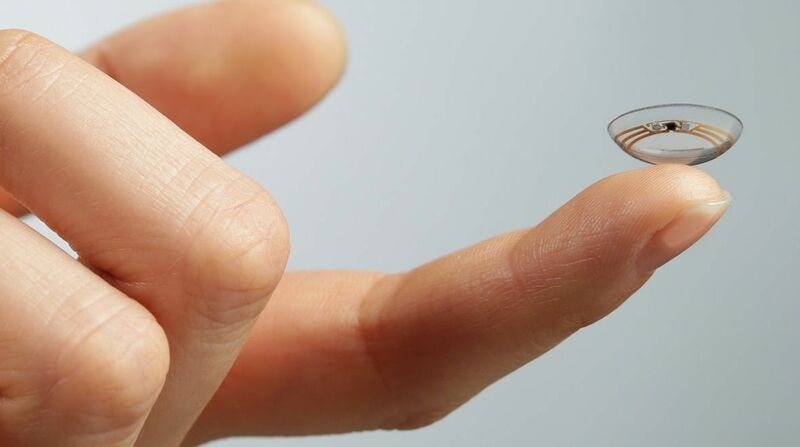 Google's health tracking smart contact lens could be solar powered when it arrives. The potentially life-saving connected lens was awarded a patent back in March this year. And, though it's not certain that Google is working on just one iteration, a new patent, unearthed by Quartz, details how it could use solar cells to run on external light sources. Look up towards the sun, recharge for the next few hours - sounds futuristic but Google is on it. The smart contact lens, detailed in the patent awarded on 13 October, would be used to track the wearer's temperature or blood alcohol levels, as well as allergens in the air and processing visual images such as price tags. It is designed to then send this information to another device such as a smartphone. As for charging, solar cells and a photodetector could turn light from ambient sunlight, overhead bulbs and even camera flashes into energy to at least partly power the electronics in the lens. The previous patent also referred to glucose monitoring which could be a gamechanger for diabetics. This prototype smart contact lens was said to charge using radio frequencies but what's likely is that if and when Google turns this tech into a real health tech product, it could use a combination of charging technologies. Google joins the race towards self-powered wearables in which exciting research is being carried out by a team at the University of Virginia which is combining solar power, body motion and body heat to power small wearable sensors. Wearable tech company Misfit has experimented with a light powered fitness tracker, a variant of the Misfit Swarovski Shine with a purple crystal, but as far as we know, this isn't on sale yet. Companies including StretchSense and scientists at Sungkyunkwan University in Korea are also working to harness both kinetic and mechanical stress - twisting and stretching - energy to power future smart clothing.